iQ Office Suites is one of the leading owners & operators of serviced office facilities in Canada. Their flexible workspace solutions feature top quality design, furnishings, and technology, and are staffed by friendly and attentive people. They have a clear and simple commitment to their members: providing a customized service designed to inspire members and to deliver maximum flexibility and performance for their business. iQ Office’s rapid expansion in the last few years came with the challenge of too much operational overhead, inability to report on key business metrics and the management of centers in multiple markets, with multiple jurisdictions. "With OfficeRnD, the member facing services and the billing work extremely well together, so you don’t have to integrate it." The iQ Office Suites’ team have always offered an extremely high level of service, but it became harder to maintain it when the company decided to hit the growth pedal. Main operational processes such as managing memberships, bookings, and one-off purchases were not integrated into their billing system, which made sending out invoices at the end of the month too time-consuming and error-prone. They didn’t have a quick and easy way to track key business metrics such as inventory, vacancy rates or forecasted revenue. Their centers are located in multiple markets, with multiple jurisdictions, which required them to manage multiple Quickbooks accounts. It was just too much manual work. The tight integration between OfficeRnD’s billing module (and it’s integration with Quickbooks) and the other key operation pillars the system handles (Memberships and Contracts, One-off purchases, Bookings took away a big chunk of the administrative responsibilities of the team. OfficeRnD’s mobile app allowed members to have control over basic everyday tasks such as booking a meeting room, downloading their past invoices or seeing what their balance is. This also lifted a great administrative burden from the IQ Office’s team, allowing them to focus on spending quality time with their members and making sure that they’re tending to their needs. 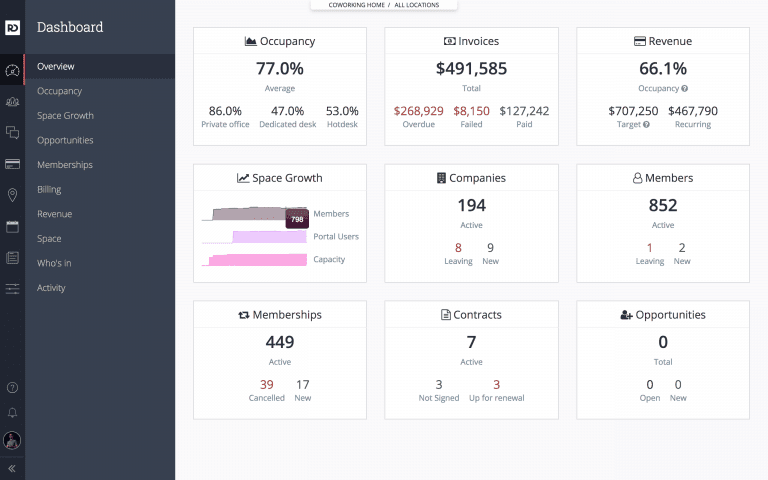 OfficeRnD’s reports that are pre-built for the flexible workspace industry provided iQ Office’s team with quick and easy access to key reports such as occupancy, revenue occupancy, forecasted revenue and more. OfficeRnD’s multi-site management capabilities allowed the iQ Office’s teams to operate all centers from 1 account. They manage multiple billing entities through it, each of which is integrated with its own Quickbooks account, making sure that accounting records are always up to date. "OfficeRnD is taking a huge administrative burden out of our location level. You’ve done a great job of developing and integrating reporting, accounting and the member facing experience in one platform." "Of all the software we’ve ever used, OfficeRnD has been our best onboarding process to date." Save time by streamlining and automating back-end processes such as accounting, payments, membership management and more. Give members control over day-to-day tasks with web and mobile apps that are completely white-labeled. Use dozens of native integrations to connect OfficeRnD to all systems already in place and keep your current operational processes.